This species can be taller than the closely related Camassia quamash, reaching heights of 1.4m (50in). It also tends to be slightly hardier and better suited to colder conditions. This seed was collected from predominantly white flowered plants, but there may be a small percentage of seed from the rarer blue flowered plants. 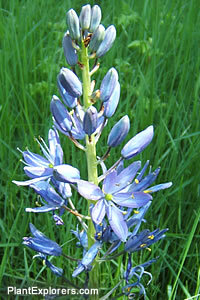 Camas bulbs were a food staple for many Pacific Northwest native peoples. Camas meadows were prized and kept free of the unrelated but similar bulbs of Zygadenus venenosus (Death Camas). For the first few years the plant is grass or small iris-like; subsequent years the plant will have flowers. Camassia is now in the family Asparagaceae.